Presently, we have a huge prevalence of quantified self-monitoring and tracking steps, calories eaten, time spent sleeping, sitting, etc. As more functionality comes from monitoring biometrics, more people are willing to share their personal data with the public. Biometrics are also useful for very important things such as authentication and health monitoring, showing a distinct vignette of an individual. When the frequency of sharing personal biometric becomes ubiquitous to gain utility, how does that scale with privacy issues and boredom of perfection? Can Hyper-personalization lead to experiential echo-chambers? A Biometric Future looks at this complex interplay in the not-too-distant future. TongueID: Information taken from the physiological make-up of one’s tastebud formation and analysis of saliva, allows chef’s to create personalized dishes based on their customers biometric data. 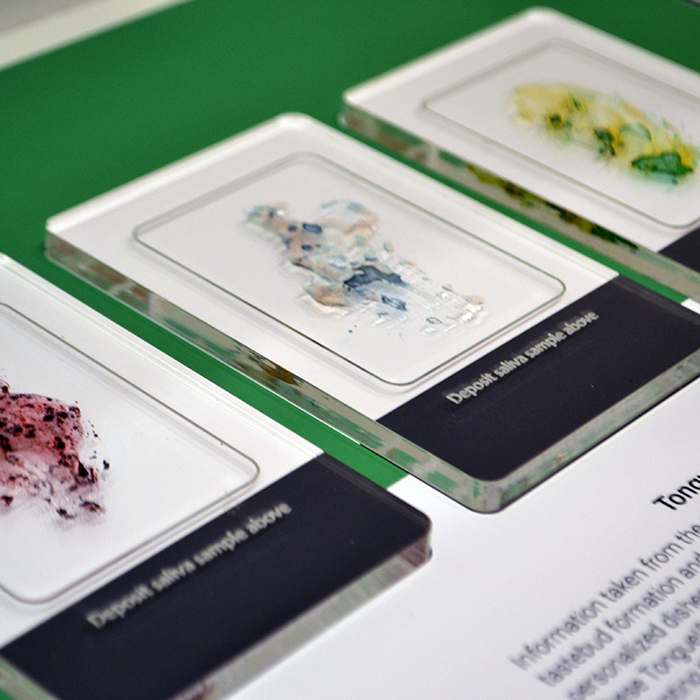 These TongueID plates replace the old system of paper menus, prompting the customer to deposit a bit of saliva to be analyzed. A visual chemical reaction occurs, giving incite to the chef to understand the way their customer perceives taste. This novel interaction and the utility of the outcome has made TongueID ubiquitous in the dining scene. 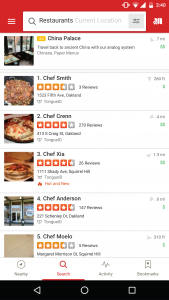 Restaurants: Due to wide-spread biometric reading, taste data, and personalization in restaurants, people now go to restaurants based on the chef’s personal style and how they cater to individuals TongueID. Analog food ordering systems, like menus, and daily specials, are now a novelty that is promoted as a nostalgic experience.